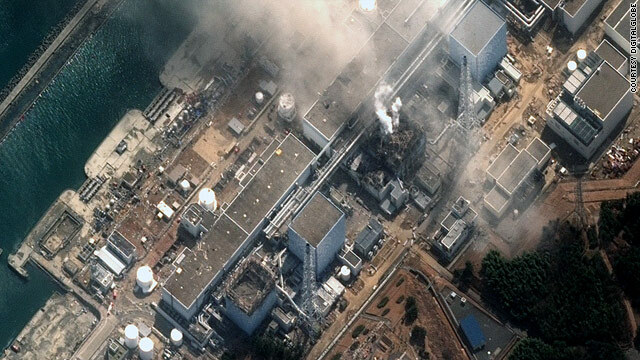 Imagery of the Fukushima Daiichi Nuclear Power Plant, taken by DigitalGlobe on March 14, 2011. (CNN) -- An explosion occured late Monday morning at the Fukushima Daiichi's No. 3 nuclear reactor building, a government official told reporters. Chief Cabinet Secretary Yukio Edano said that the head of the nuclear plant reports that the container vessel, surrounding the reactor, remains intact. Japanese public broadcaster NHK showed images of white smoke rising above the facility, which is in northeastern Japan. Citing the nation's nuclear and industrial agency, NHK said that a wall of one of the reactor's buildings had collapsed. The 600 residents remaining within 20 kilometers of the plant, despite an earlier evacuation order, have been ordered to stay indoors, according to Edano. The secretary added that initial reports suggested that radiation levels had increased after the blast. But Edano said he did not believe there was a massive leak, given that water continues to be injected into the reactors and that the pressure inside the reactor is "within a certain range." "We are now collecting information on the concentration of radiation," Edano said. The facility is in the area of northeast Japan devasted by last week's earthquake and tsunami.